Israel Folau is one of the most exciting talents in the modern game having made a high-profile switch to union following stints in rugby league and Australian Rules football. Folau joined the Waratahs in December 2012 having made his name in the 13-man code. He made his National Rugby League bow for the Melbourne Storm as a 17-year-old in 2007 and broke the record for the most tries by a rookie in their debut season. His outstanding form was rewarded with the Rookie of the Year honour and later that year he became the youngest player to represent Australia aged 18 years and 194 days. He also played in the Stade of Origin, representing Queensland, and also turned out for Australia in the 2008 Rugby League World Cup before switching to the Brisbane Broncos. Despite excelling in during a two-year stint with the Broncos, he opted to sign for Australian Football League side the Greater Western Sydney Giants in 2010 and after initially struggling to impress, he eventually made his debut in 2012. Folau embraced a third football code at the end of that year by putting pen to paper on a one-year deal with the Waratahs. He wasted no time in impressing the national selectors during the 2013 Super Rugby season and was drafted into the Wallabies' squad for the visit of the British & Irish Lions. He made a sensational Test debut in the first Test clash with the Lions in Brisbane - grabbing two tries in a narrow defeat. 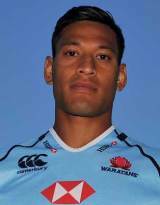 Later that year, with rugby league clubs reportedly circling in a bid to lure him back to the 13-man code, Folau agreed a new deal with the Waratahs and the Australian Rugby Union that will see him remain in union until the end of 2015.